Looking back over the past 18 months, I believe that starting Fashion Mumblr was one of my greatest decisions. Having the outlet to loose myself in creativity, and write about whatever I like is so fulfilling and rewarding. I never could have imagined the people I would meet and the experiences I would have when I first started – I never even imagined that people would even care about what I have to say! And I know that there are so many blogs out there, and that my little corner of the internet is still just a tiny blog, but for me, it’s something I am passionate about and is quickly growing into something far more important to me than I ever could have dreamt of. So why do I love blogging so much? Us bloggers are a creative bunch! By blogging, we are creating, and then sharing what we create with the blogging community and our readers. Maybe you don’t get to be as creative as you’d like in your job, and need an outlet that allows you to write, photograph, and publish creative content. For me, working within PR & Marketing for a Fashion Software company means I have limited room for creativity in my day job, so I get huge fulfilment and satisfaction from hitting the publish button on each post and seeing others enjoying my creative output just as much as I enjoy making it! A blog is often a very personal place, yet one which we share with the world. My blog is an extension of me – by sharing what I do and what I love, I am completely immersing myself in Fashion Mumblr and escaping the outside world for a few hours. We all know that the lives painted in a lot of blogs is only seeing the perfect side of our day to day lives, and of course that’s the same with mine. But if I can create a perfect, happy life on the internet, then why shouldn’t I! I also love to look back at how the blog has grown, and how I’ve grown as a person. So far, Fashion Mumblr has documented my journey from University Student, to Fashion Marketing Intern at Mulberry, to Graduating, through to get a real job in the real world! Starting Fashion Mumblr, wearing a onesie curled up on my sofa, I never thought I would end up making such lovely friends through blogging, or that I would get to be having breakfast with fellow bloggers at Duck & Waffle, or sitting FROW at New York Fashion Week. Not in a million years! But blogging is such a fabulous community, we all want to support each other and share these wonderful experiences. As I continue blogging, I can’t wait to see where I will travel to next, and all the lovely people i’ll get to meet! No, not because of the crazy heels that I now count as my daily uniform but from the skills that you can develop through growing your blog. From just one post, you are researching, writing, editing, photographing, and creating exciting new content. That’s just the obvious things too, what about the organisation skills of scheduling, working with brands, planning your social media? Then there’s the business side of blogging, collaborating, networking… there’s so much more to blogging that just taking pretty pictures and writing about it. They say that there are too many bloggers out there now, but so what? If someone applies for an internship at work, and they’ve got a blog, then I know that they are a proactive person who can work successfully by themselves, and has determination and creativity. As far as my career is concerned, yes blogging takes up a lot of time, but I find they often go hand in hand, my blog helps my job and vice versa. Since working full time, my blog has helped me in so many ways and I hope this will only continue. Yes it’s a commitment, but would I spend hours each day blogging if I didn’t enjoy it? Would I wake up an hour early for work to plan the days post, and pour myself into every word I write, if I didn’t love it? Absolutely not! I love the thrill of publishing a new post, the comments I get always bring smile to my face, and the feedback I received from my recent blog survey just gave me even more determination to carry on blogging. Running a blog, and having a full time career is not easy, but it’s something that I’m passionate about and hope to continue doing for many years to come. 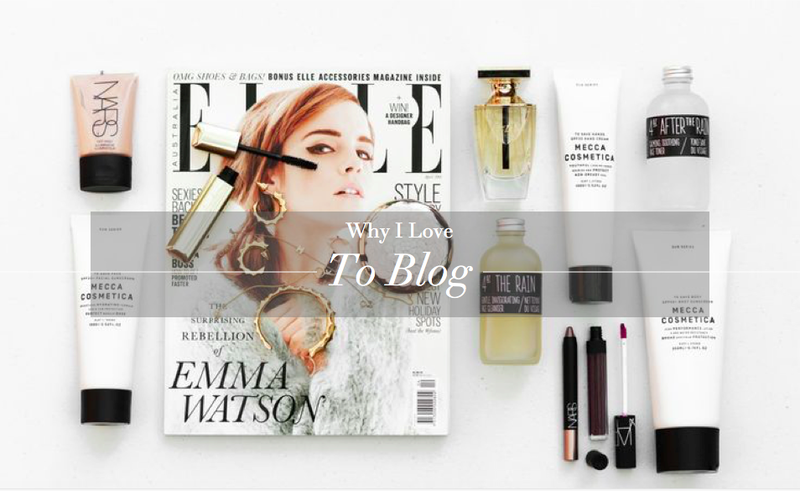 If you’re a blogger, I’d love to know why you love to blog! How does blogging create happiness for you? Next Post Sleek’s Budget Brows!